Have you heard it? You can if you listen. It's coming. That's right, DC Universe Rebirth! 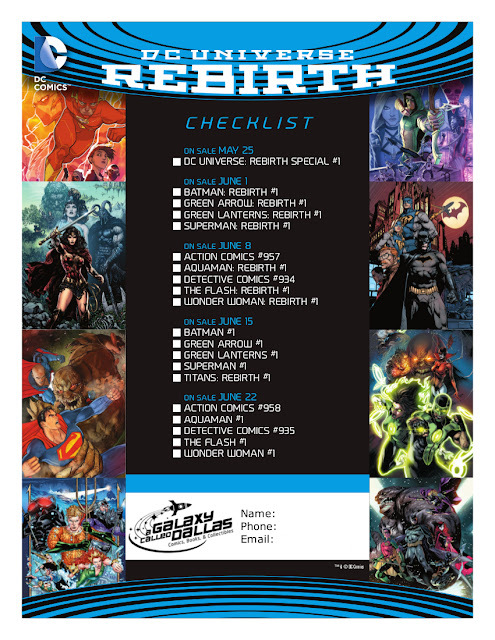 DC is continuing where the New 52 ended but restoring the DC universe to it's pre-Flashpoint days. I'm still trying to wrap my head around it, but you don't need to be confused by what's coming out. Here's a checklist to keep you straight. Check off which series you wish to subscribe. We'll keep it on hold for you until you pick it up. Just print this out and bring it in or email/Facebook us with your selections.